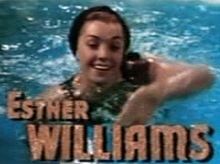 Who could ever forget Doris Day in this film. The Film is so exuberant, so joyous and so colourful that it cannot help but cheer you up! 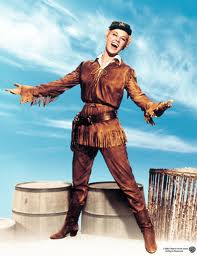 Doris Day plays the role of her career as Calamity Jane the wildcat tomboy of Deadwood City. 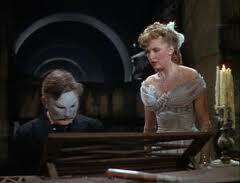 The fun starts when Calamity is sent to Chicago to find a vaudeville beauty who will perform at the local bar. Instead she ends up with the star’s maid, Katie, who decides try to impersonate the star but with less than good results – although things turn out well in the end. Together the two find fun, love and along the way some wonderful songs. My daughters loved this film and even now we watch it on occasions. 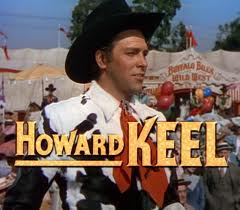 There is also Howard Keel as Wild Bill Hickock. I remember Howard Keel came to England to film Floods of Fear in 1958 which was a change from the films we had come to know him for but it was not a box office success although very good in it’s own way. I hadn’t realised but there was also a low budget film made in 1950 called The Texan meets Calamity Jane. That was the title and it was filmed in TruColor. 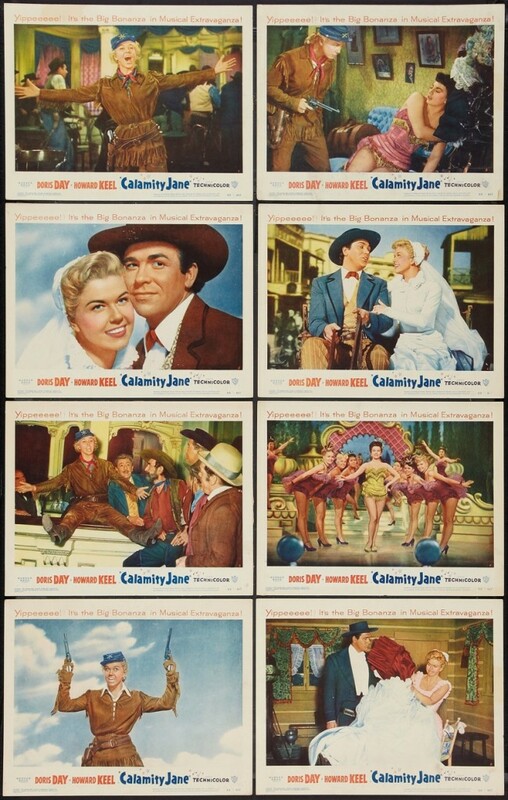 In this one the depiction of Calamitiy Jane’s love for the late lamented Hickock and her reluctance to be caught up in a flirtation with lawyer Eliison give the film an air of gravity and romance missing from most B westerns of the era. It starred Evelyn Ankers as Calamity Jane who after this film quit the movies for married life and motherhood . She was 32- years-old and was married to Richard Denning. She had the previous year appeared with Lex Barker in Tarzans Magic Fountain which is one of my favourites among the Tarzan movies. Back to Doris Day – she was one of the most successful films stars of all time really – certainly during the 50s and to a lesser extent the 60s she was around in some great and enjoyable films and was able to play in musicals like this one as well as light comedies with Rock Hudson and even Clark Gable as well as dramatic roles such as The Man Who Knew Too Much AND a lesser known one called Julie where she was being hunted down by her husband played in sinister form by Louis Jourdan culminating in a tense ending where she has to land an airliner full of passengers. 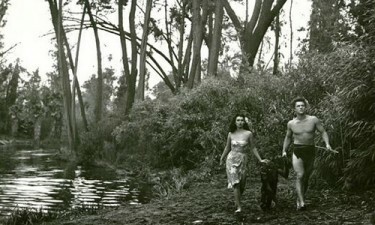 The maniacal husband-as-stalker was a new kind of character for films in 1956. 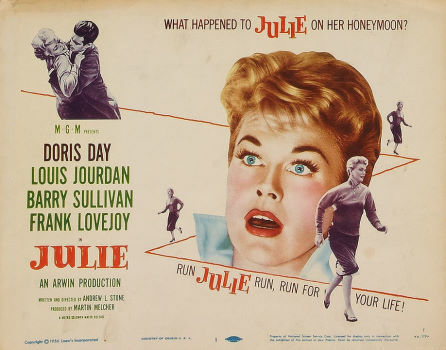 Doris Day plays the role of a terrorized wife trying to escape from the husband who is trying to kill her, and this is such a well-done film that even audiences of today would respond to it. 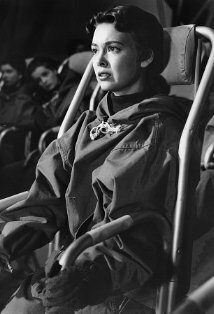 The climactic scene in which Doris Day lands the passenger plane with help from the control tower is riveting, because it is supposedly based on fact. Whenever I read a review of this film it always seems to be a poor one BUT I thought it was a very good adventure film beautifully filmed in India. 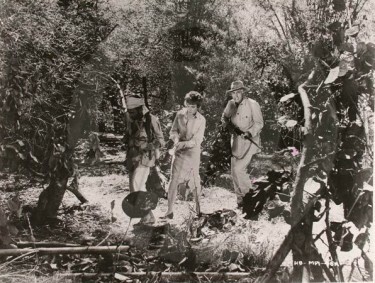 Any exotic locations such as Africa or India proved a great backcloth for any adventure story of this type and particularly for a colour film in Cinemascope. . Stewart Granger looked the part in this one – very much in the same mould as Allan Quartermain in King Solomons Mines. 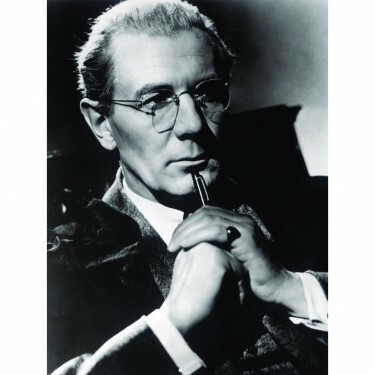 His character in the film Harry Black is far from infallible – he is a man who survived WWII – albeit with a badly damaged leg – but is still at war with his personal demons as well as a man-eating tiger. 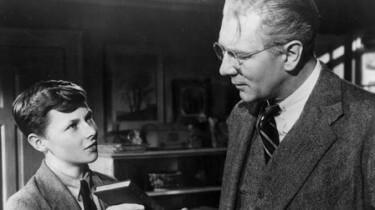 At times in the film there are flashbacks which are integral to the plot, and the on screen chemistry between Harry (Granger) and Christian (Barbara Rush) is palpable. Anthony Steel plays Christian’s husband – not a very appealing role for him. The landscape and wildlife photography is terrific and the movie does a fine job of showing the people of India and their culture. I particularly enjoyed the depiction of the relationship of Harry and his gun-bearer Bapu (I.S. 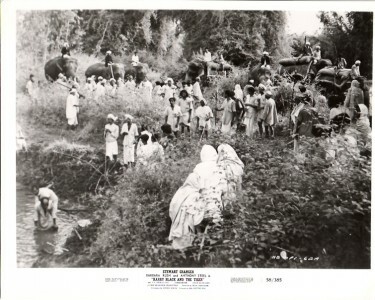 Johar – another role for him was in North West Frontier as the train driver a year later) – which appeared to be built on mutual respect. All in all this film is definitely a “must see” for fans of classic action/adventure films. 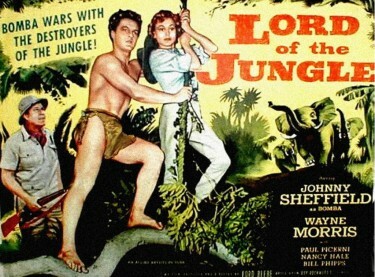 Stewart Granger and Barbara Rush search for the man-eating tiger – above. Stewart Granger had by this time had the best years of his film career which took him to Hollywood to star in some big budget films. 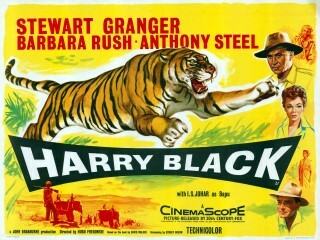 Harry Black and the Tiger was produced and financed by John Brabourne who was the Son-In-Law of Earl Mountbatten who had an interest in film making and decided on this one. I do remember on a This is Your Life show featuring the life of Lord Brabourne back in October 1990 that Stewart Granger was one of the main guests - and the family seemed to be very good friends with him – and he re-counted experiences on this film. This was obviously well after the film had been made and in fact this was the first film he did produce. Anthony Steel was a British actor best known for his appearances in British war films of the 1950s such asThe Wooden Horse 1950. He was described as the perfect Imperial actor, born out of his time, blue-eyed, square-jawed, clean-cut. 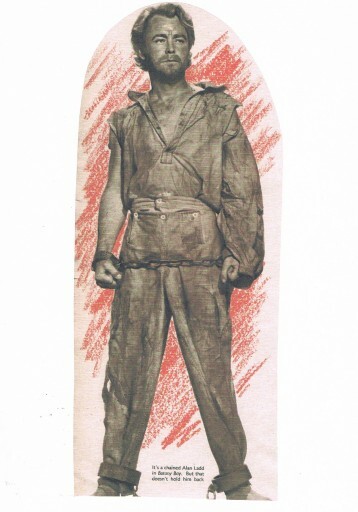 As another writer put it, “whenever a chunky dependable hero was required to portray grace under pressure in wartime or the concerns of a game warden in a remote corner of the empire, Steel was sure to be called upon – maybe typecast but at the time successful. This was the case in Where No Vultures Fly and Harry Black – films which were made at each end of the decade. Think he was in the original ‘Crossroads’ TV series for a while much later in his career. Also he was in a brilliant episode of Tales of the Unexpected in 1980 with John Mills called ‘Galloping Foxley’. I really liked that one. 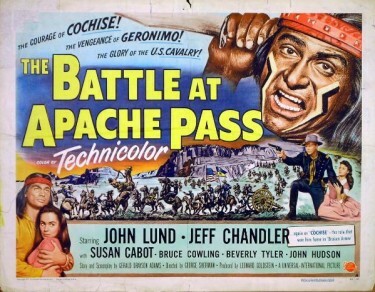 She played the female lead in this film after her film career got off to a good start in 1951 when she appeared in When Worlds Collide and Black Shield of Falworth and Taza Son of Cochise among many others. Above – When Worlds Collide – Barbara Rush. Barbara Rush married actor Jeffrey Hunter in 1950 and had a son, Christopher but they divorced in 1955. She then married publicist Warren Cowan in 1959 and their daughter Claudia is a journalist with Fox News TV. The headlines show him as one of the stars of The Pink Panther but I will recall him for all those roles throughout the fifties like in North West Frontier from 1959 which conicidentally I have just been preparing for a post very shortly. There were others – The Ladykillers , Fire Down Below and War and Peace among many. He was a prolific film actor of the time and a very good one at that. 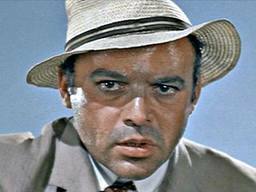 The above still from North West Frontier I feel really captures the style of Herbert Lom in this role as Van Liden in a thrilling railway escape through India. His son Alec said: “Like many actors, he never wanted to be pigeon-holed in a particular role and, after having played the role of East European gangster in many films, it was a delight to him later in his career to be cast by Pink Panther producer and director Blake Edwards in a comedy role opposite Peter Sellers, and he hugely enjoyed that move. Something I didn’t know was that in the early 1950s, Herbert Lom had a huge stage success as the King of Siam in the original London production of musical hit The King And I at the Theatre Royal Drury Lane opposite Valerie Hobson. 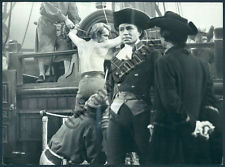 It was the part that had been made famous by Yul Brynner on Broadway who also starred in the film version. The Man Who Watched Trains Go By – who remembers this one ? I don’t know why but I quite often think of this film title – particularly when crossing a rail line or even on a train journey. Funny because I have never seen the film – and it is NOT widely known these days. Maybe it is just the that title intrigues me. Who knows. 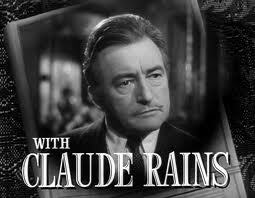 This is a rarity, an obscure colour film starring Claude Rains late in his career – he was 63 when it was made. 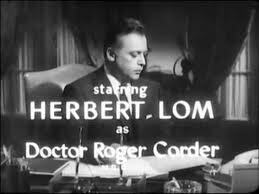 He plays a quiet and respectable Chief Clerk of a Dutch manufacturing firm which is owned by Herbert Lom and his aged father. Unknown to everyone, Lom has been obsessed for some time by a scheming and criminal Parisian prostitute played by Marta Toren. He has looted the company of all of its cash and left it a bankrupt shell prior to running off to Paris to a new life with his beloved. This is discovered at the last minute by Rains, who has sunk his entire family’s savings in the company, and hence lost everything. Rains snaps and turns on Lom, pushing him into a canal in a rage, where Lom drowns. Rains takes Lom’s suitcase containing all the company’s remaining cash and runs off to Paris, which he has always wanted to visit. He has been a train-spotter all his life, and for years has been noting the passage of the Paris Express. Now at last he is on it. Marius Goring is a Dutch policeman who suspects Lom, and now trails Rains. When he arrives in Paris, Rains wants to find Marta Toren and he asks directions of a young prostitute in the street played by the 20 year-old Anouk Aimée. Eventually, Rains meets up with Toren, who at first laughs at him as a ridiculous old man and throws him out. Her attitude towards him changes however when she realizes he has Lom’s money. Things go from bad to worse as Rains sinks deeper and deeper into delusion and intrigue. The film is only mildly interesting, but the performance of Claude Rains is masterful, and truly makes something out of nothing. Admirers of Claude Rains will like watching this. 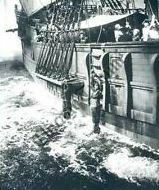 Rains served in World War One in the London Scottish Regiment with fellow actors Basil Rathbone, Ronald Colman and Herbert Marshall. He was involved in a gas attack that left him nearly blind in one eye for the rest of his life. However, the war did aid his social advancement and, by its end, he had risen to the rank of Captain. 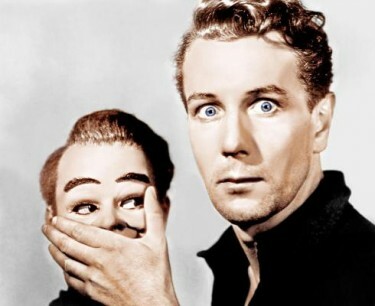 From his glitteringly successful film career I can think back to a colour version of The Pahntom of The Opera 1943 – before I could remember BUT sometimes seen on TV. From To-Days Cinema Magazine of 8th August 1957 – this advertisement for the Film Distributors shows what would be coming up in the near future. 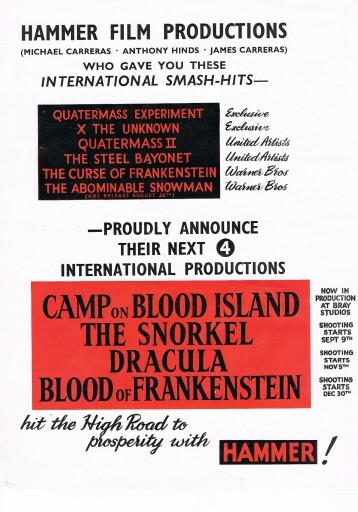 The Curse of Frankenstein was a big one for Hammer and went incredibly well here and in the USA which was a market that needed cracked by the British Film Companies if they could. 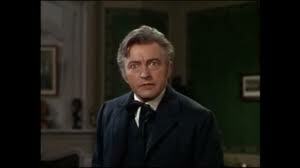 Hammer Films was really a very good studio - not just for horror movies but also for war ones. 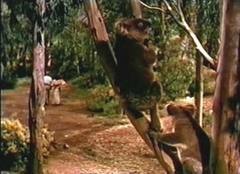 Remember Val Guest’s films such as CAMP ON BLOOD ISLAND and YESTERDAY’S ENEMY. These films were very tense, well paced, sharply shot, with very deep characters. I don’t know much about The Steel Bayonet but have found out that it is the story of a group of British soldiers, during WW2, in Tunisia, who get orders to hold a position, in the middle of the desert, in order to prevent Afrika Korps advancing. The Abominable Snowman was also a good one but I think in Black and White and I reckon Forrest Tucker was in that with Peter Cushing. The Snorkel is directed by Guy Green who had early in the fifties been the colour camera expert on The Story of Robin Hood for Disney. The film stars Peter van Eyck, Betta St. John, Mandy Miller, Gregoire Aslan & William Franklyn. The story has us witness the perfect murder of a wife and mother, and we know who perpetrated it as well, it’s the husband! There’s a gimmick, the snorkel of the title, and film’s success mostly hinges on a devilish twist for the finale. In between the plot revolves around the daughter of the deceased, Candy – Mandy Miller, trying to prove her stepfather has killed her mother even though it appears near impossible for him to have done it. Stepfather has plans for Candy as well. 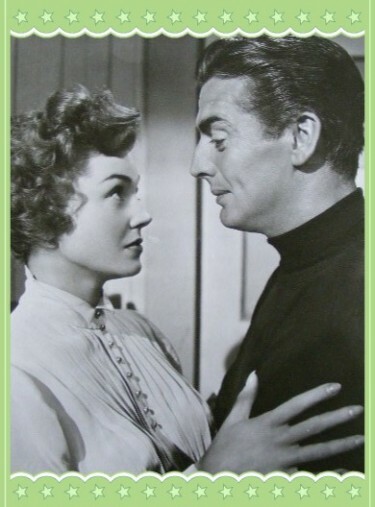 You will remember Many Miller for films BUT I featured her earlier in Adventures in the Hopfields – which is good. I don’t remember this film at all – BUT it does sound good. 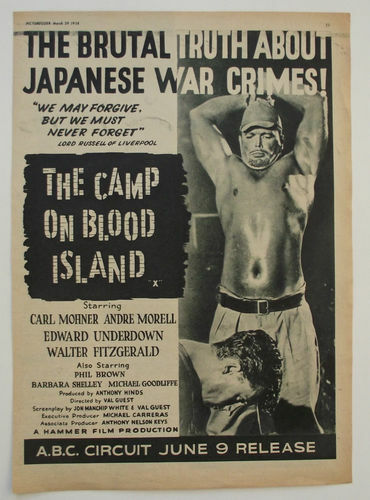 The Camp on Blood Island I well remember and when I see the picture above it shows just how horrifying an ordeal it must have been for those servicemen who were taken prisoner by the Japanese during the Second World War. It stars one of my favourite actors Andre Morell. Also cast is Edward Underdown – who much later was in Dads Army very odd times – and also Hammer stalwart Barbara Shelley. 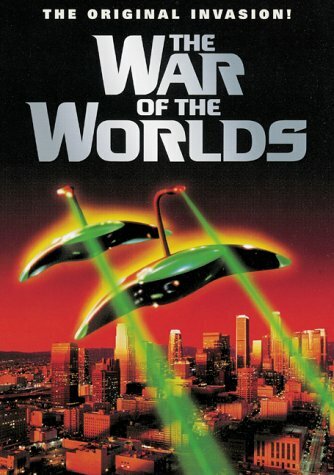 I will return to this film in a ater post I am sure !